I am directed to convey the sanction of the Competent authority to the following amendments in Para 2 of GoI letter No. 22d(50)/2007/US(WE)/D(Res) dated 27th Nov 2015 as amended vide Ministry of Defence letter No. 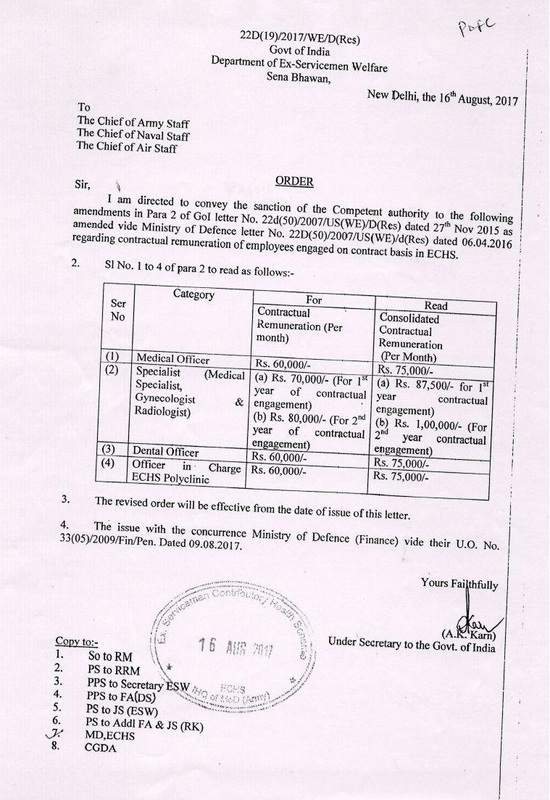 22D(50)/2007/US(WE)/d(Res) dated 06.04.2016 regarding contractual remuneration of employees engaged on contract basis in ECHS. 3. The revised order will be effective from the date of issue of this letter. 4. The issue with the concurrence Ministry of Defence (Finance) vide their U.O. No. 33(05)/2009/Fin/Pen. Dated 09.08.2017. 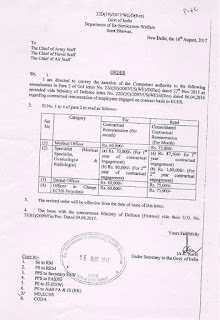 Ministry of Defence, Department of Ex-servicemen Welfare Order dated 16-08-2017 regarding amendments in contractual remuneration of employees engaged on contract basis in ECHS.